IRS Special Agent Tara Holloway is out to sink Noah Fischer, the charismatic minister of the Ark mega-church. While Fischer may not worship a golden calf, he’s milking the church like his personal cash cow, financing his luxury home, designer wardrobe, and lavish vacations via the church’s collection plate. Despite repeated requests for the taxes due, Fischer has yet to render unto Caesar. As if dealing with an uncooperative preacher and his extensive legal team isn’t bad enough, Tara’s also pursuing the vice-president of The Republic of Texas, a militant separatist group purporting to operate its own sovereign nation. August Buchmeyer hasn’t paid taxes since Ronald Reagan was in the White House and is none too happy when Tara comes to collect. Tara’s usual partner, Eddie, has been temporarily promoted to head the Dallas Criminal Investigations office while their boss, Lu Lobozinski, undergoes treatment for lung cancer. Unfortunately, the chemotherapy reduces Lu’s signature eight-inch strawberry-blond beehive to pitiful peach fuzz. Even Lu’s Chinese contraband extra-hold hairspray isn’t enough to give her thinning hair its customary height and attitude. Tara vows to find Lu a wig just like her usual updo, but it’s not easy to find a beehive wig these days, let alone one in Lu’s unique pinkish-orange color. To make matters worse, Tara’s boyfriend, Brett, has gone to Atlanta for business, leaving her vulnerable to the charms of Nick Pratt, another special agent assigned to assist her on the Ark and Republic of Texas cases. 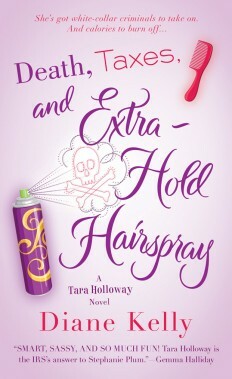 Tara’s life has become a hopelessly tangled mess. Can she find a way out of these hairy situations?